There are many paths that can lead to a great story. Some are straight and narrow while others are long and winding. Yet the best are the ones littered with bodies and covered in blood. Or at least some people may think that. Most likely those that dress like clowns or those who’ve dated those who dress like clowns. At least that’s what we expect, but what if things aren’t the way they seem? What if the villain isn’t who we think? What if a horrible massacre is only the beginning? And how much can our heroes truly take? An extreme act of violence has rocked the superhero community. Many are dead. Heroes both new and familiar will never again spout their corny catchphrases. The sanctuary has been compromised, heroes have been murdered, and their killer is on the loose. It’s up to the Trinity to bring that killer to justice, but who is the killer? That is unknown. However, the suspects include none other than Harley Quinn and . . . Booster Gold?! As we have seen with Batman Rebirth, Tom King (Mister Miracle) is not afraid to try new things. He’s taken some risks on the stories he’s told and in the process, he’s given us some pretty interesting stuff. It’s true that not everything he tries pans out, but you can’t hate on him for trying to be original. 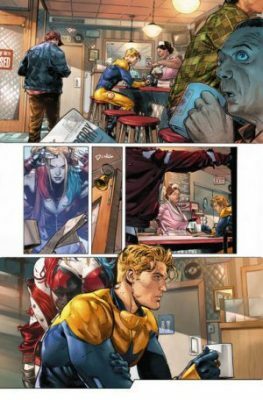 Case in point Heroes In Crisis. This may just be his best work yet! Of course, one issue is too soon to confidently state that, but it’s off to a great start. The tone of this book is pretty heavy and it’s obvious it’s going to touch on some fairly intense issues. Considering the story revolves around a help center for Superheroes, that shouldn’t be overly surprising. To start off his 9 part mystery, King gives us a gruesome crime scene, three intrepid heroes, and two suspects. Followed by nothing but questions. The pacing is perfect, and the story holds your attention from beginning to end. It’s also surprisingly action packed with some very well done action scenes. I have no doubt that King has an insanely twisty tale plotted out that will keeping us guessing up until issue 9. You can tell this story is personal for him, and I think he’ll be pouring his soul into it. I can not wait to see where he goes with it. Of course, an intense story such as this can be completely undermined if the art can’t back it up. 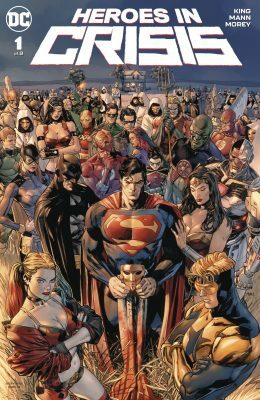 Fortunately for us, that is not the case for Heroes In Crisis. Clay Mann (Trinity) gives us some stunning art that brings this epic mystery to life. The fight scenes in this book are perfectly illustrated. They capture each moment with a kind of intensity which makes you feel caught up in the action, the same way an action film might. The emotion of the characters is brought out in each panel and you can clearly see the pain (emotional and physical) that they are trying to overcome. If you are looking for a hard-hitting book with a story that you can really get invested in look no further. Heroes In Crisis is a true page-turner, worthy of your time. Not only does it boast relevant content, but it also gives us a fresh look at the troubles of a superhero. This story will no doubt take us into the minds of our heroes and show us the unseen trauma inflicted on those who save the world. It’s true that this book also contains the deaths of some well-known characters, and I know this will influence some of the sales. However, the real reason to buy this book is for the story. Which is what all books should be bought for, instead of for a wang shot or a first appearance. Nonetheless, this is a book that should not be missed.